At about 7.05 to 7.10 pm CDT (UTC-5 hours), on 18 August 1958, Alex Donald Chisholm, a business machine mechanic, aged 30, of Warren, Michigan (42:27N; 83:03W) was in his back yard when he observed a flight of four aircraft, which then drew his attention to an extremely bright "star," motionless in the sky at 70-75 degrees elevation, azimuth 300 degrees. The "star" was brighter than the Moon. He drew Walter Moilanion's (his neighbour) attention to it. Chisholm then viewed the light through 8x30 field glasses, and then again with the naked eye (through spectacles.) After 7-8 minutes, the object which had remained motionless until then, moved slightly. At this point, Chisholm (viewing through the field glasses) and Moilanion (with naked eye) pictured it as a circular object, light gray in colour, and shaped like the planet Saturn (as it was circular surrounded by a ring.) Chisholm estimated that the object was between 75-600 miles above the earth, and about 60 feet in diameter. After 30 seconds after first moving, it "vanished as if in a fast vaporised movement." There was no associated sound at any stage. a. 18 August 1958 - a five page letter from the witness to NICAP. b. 19 August 1958 - a three page report from 661st ACWRON Selfridge AFB. c. 20 August 1958 - a three page report from 1st FTR WG Selfridge AFB. d. 25 August 1958 - a two page NICAP report form completed by the witness. e. Undated - a two page letter from witness to NICAP which NICAP received on 27 August 1958.
f. It should be noted that the other male witness did not submit an independent report form. a. The Sun was three degrees above the horizon at azimuth 285 degrees. Thus the object was 15 degrees azimuth to the right of the setting Sun (sunset was at about 7.30pm) but 70 degrees higher up in the sky, The witness stated that the Sun was slightly above the horizon. b. The Moon was at 21 degrees elevation; azimuth 235 degrees, i.e. 65 degrees to the left of the object, and 20 % illuminated. It was 4.3 days old. The witness however, stated that the Moon, although at last quarter was not visible in the sky. This is incorrect. d. Most of my summary above is taken from the 18 August 1958 typed letter from the witness to NICAP. 1. Documentation b says "object faded very rapidly without noticeable diminishment in size, vaporized." 2. Documentation a says "it vanished as if in a fast vaporised moment." f. The object was not constantly viewed through optical aid for the entire observation. 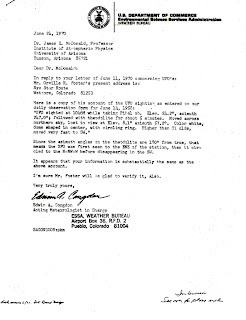 The Project Blue Book documentation assigns an incorrect date of 17 August 1958 to the sighting. However, their final evaluation was that the sighting was "unidentified." Recent discussion on the NICAP googlegroups forum, centred around the suggestion that the object was perhaps a stratospheric balloon, launched from Anota, Minnesota on 17 August 1958. Thank you to Barry Greenwood from Boston in the USA, for supplying the NICAP letters/report form. The full documentation may be read on the NICAP website. One of the projects which I listed on my 2018 work plan, was to study the publicly available information on the Advanced Aerospace Threat Identification Program (AATIP.) I am still in the early days of studying the material I have gathered, and placed in my "to do at some stage" folder. One aspect of this material stood out, and this was reference to "metal alloys." The initial reference surfaced in the 16 December 2017 issue of the New York Times, in an article authored by Helene Cooper, Ralph Blumenthal and Leslie Kean, titled "Glowing Auras and 'Black Money': The Pentagon's Mysterious U.F.O. program." "Under Mr Bigelow's direction, the company modified buildings in Las Vegas for the storage of metal alloys and other materials that Mr Elizondo and program contractors said had been recovered from unidentified aerial phenomena." Following the revelation concerning the existence of the program, a number of individuals who were associated with aspects of the program, started to give interviews in the mass media. 1. Journalist Giuliano Marinkovic interviewed AATIP program manager, Luis Elizondo, in January 2018. Elizondo stated that BASS was required by the contract to provide a secure storage facility to store data and any material generated by the program. "We are not talking of unknown alloys. We are talking of metamaterials which have isotopic ratios not found on this planet. They would be very expensive for us to reproduce." 2. Dr Eric W Davis was interviewed on "Coast to Coast" radio on 28 January 2018. Davis works for the Institute of Advanced Studies in Austin, Texas. He was a sub-contractor to BASS. His role was to provide broad scientific advice and create a series of expert studies. These studies were tasked with extrapolating our current technology to the year 2050 and comparing these to UAP. Davis stated that he was not privy to AATIP data analysis. There was no mention of "metal alloys" in this interview. 3. 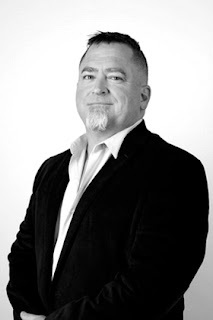 Luis Elizondo was interviewed by George Knapp on "Coast to Coast" radio on 25 February 2018, Elizondo was a program manager for AATIP. Knapp asked Elizondo about metals with unusual properties and AATIP. Elizondo responded that they do exist. The material displays unique characteristics. He can't say what the government has in its possession, but as far as BASS goes, there were very unusual properties. found. Isotopic ratios that are very unique. Not found naturally on this planet. Have been analysed and appear to be manufactured. When stimulus used - reacts in a certain way. "I am not talking about an unknown element or a metal alloy." It is not a new element. Origin remains unknown. 4. 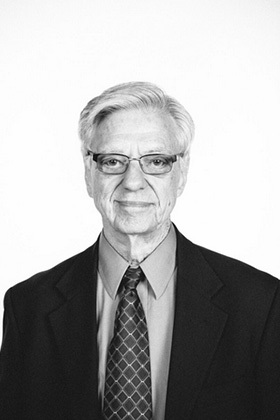 Physicist Hal Puthoff was on "Coast to Coast" radio being interviewed by George Knapp on 28 February 2018. Puthoff works at the Institute of Advanced Studies in Austin, Texas. Like Davis, he was involved as a sub-contractor for BASS obtaining expert views. Knapp asked Puthoff about the New York Times reference to exotic material of unknown origin. In response, Puthoff said "I had a chance to look at some material." It is complex. No new elements. Layers of various kinds of material which you wouldn't expect to be layered. It will be some time before we figure out how to make them. If some more material becomes available we will learn more. 1. As far as I am aware, no-one has yet obtained documents under the US FOIA which relate to the AATIP and material having unusual properties. What we do have, are individuals who were involved in the program telling us that there was/is such material. The details they describe remain extremely vague. Only Hal Puthoff admitted to having looked at some material. 2. No articles have appeared in peer reviewed scientific journals describing such unusual material. 3. In short, we have no hard data on the properties of this material, nor indeed official confirmation of the existence of such material held by the US Department of Defence. "In the seventies, when McDonnell-Douglas had a secret study of UFOs under way, who do you think was showing up regularly from Washington to monitor their progress? It was Kit, sent by CIA on official business. He came over whenever one of their aircraft had a sighting. John Schuessler told me that. I found that communication with him was always a one way street. Those guys are trained that way. "Whatever happened to the McDonnell study?" "All they got were some pieces of metal, and they couldn't learn anything from the analysis, it was futile. Of course, being an aircraft company, they thought they would quickly crack the design, the propulsion system..."
I have been continuing my examination of the electronic files of former US researcher Dr. Michael Swords, who kindly provided me with a copy of these extensive files. There are numerous Australian cases amongst this material, which I have slowly been going through. This post examines an apparent abduction experience, one of the reported earliest for this country. For a comprehensive catalogue of Australian abduction accounts, take a look here. The source for this particular early Australian abduction account comes from Sydney researcher Bill Chalker, who included it in a piece he wrote for Australian "Penthouse" magazine of November 1989, page 37. The event took place near Hughenden in Queensland, see the Google map below. It involved a then twelve year old girl, given the alias of Miss L. She was crossing a paddock on the family farm when she felt a strange force upon her, and she heard a "humming" sound. She felt as if she was being lifted off the ground and fainted. She awoke to find herself in a large, strange room. The room was not furnished. She noticed an arched doorway leading into a corridor; that there were porthole-like windows along one wall, and that the room had no joins or seams. After surveying the room, which featured a coloured galaxy display on one wall, the girl felt enormous pressure and again lost consciousness. She found herself back on the farm, but in a different paddock, with a huge saucer shaped object j=hovering above her, before it rapidly ascended to the west. The girl believed that two hours had elapsed since she initially lost consciousness. It was therefore with some surprise that I found that amongst the Swords' material were three pages of documents related to this case. Document one was headed "UFO 1956 Cressy Station, Hughenden, Australia" and a signature which looks like "F Jedlicko." This appears to be a plan of the object as seen from above. Document two is headed "Interior of UFO 1956. Cressy Station, Hughenden, Qld, Australia. 21 deg lat. Travelling West." It is an annotated numbered key to features shown in document three. It is signed in the same name as document one shows, but provides the address Box 183, Elsternwick, Australia 3185. I assume this is the postal address of the witness, who at this stage, post 1956, lived in Victoria and this is why the Victorian UFO Research Society looked into the report. Document three is a sketch with numbers, showing the girl and the two entities and various features of the room she was in. A fascinating insight into this very early Australian abduction account. It is a pity that most of the VUFORS archives were lost with the passing of VUFORS researchers, Paul Norman and Judith Magee. 1. A search of 163 graziers listed for the Hughenden, area of Queensland, listed in the current Telstra yellow pages failed to locate a current station named "Cressy Station", or any owner whose name was similar to F Jedlicko or F Fedlicko. 2. Hughenden, Queensland is at latitude 20.85 south and longitude 144.2 East. 3. An Internet search for a "Cressy Station" located a 1963 paper concerning a Cressy Station in the Great Artisian Basin, Queensland located at latitude 21.8 deg S; longitude 143.8 deg E. This location is SW of Hughenden. 4. Further search turned up an R S Blacket, Cressy Station, Corfield, Qld 4733. This is apparently Rob and Roslyn Blacket Corfield is to the SW of Hughenden. a. "Telegraph" (Brisbane.) Wednesday 13 September 1939, page 17. Owners of Cressy Station, Corfield are a Mr and Mrs R Logan, and son Alan Beaufort Logan who was then marrying Lucy Beryl Wedgwood. b. "Queensland Country Life" Thursday 17 November 1949 page 11. Sale of rams to Cressy Pastoral Company of Cressy Station, Corfield. c. "The Longreach Leader" Friday 20 July 1951 page 11, records the death of Raymond Hough Logan, aged 76, of Brisbane, former owner of Cressy, Corfield. 7. The My Heritage website records the fact that Alan and Beryl had four children. I had my genealogy expert take a look for details of the four children. We were only able to establish that one was a Brian Charles Logan; who was born in 1942 and died in 1946. We couldn't find any details on any of the other three children. 8. However, it would seem reasonable to me, that if Alan Logan married Beryl Wedgwood in 1939 then it is possible that they had a daughter who was 12 years old in 1956, a Miss Logan, our "Miss L." of the VUFORS report. 9. The name on the VUFORS held paperwork, F Jedlicko or F Fedlicko, or some similar combination of letters, could potentially be Miss L's married name, at the time she was interviewed by investigators from the VUFORs. 10. Can any blog readers throw any more light on Miss L's identity? 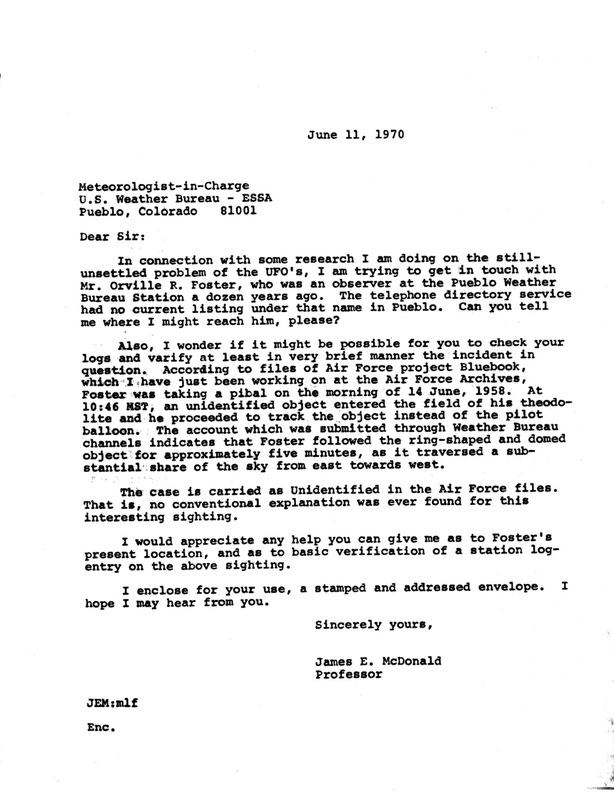 The late Dr. James E McDonald visited the former USAF's Project Blue Book on a number of occasions and gathered together a collection of sightings, which interested him. I published a blog back in February 2017, about this aspect of his UAP work. As one of my 2018 projects, I am revisiting my earlier work on these selected Blue Book files. This blog post concerns one of the cases McDonald saw some value in, namely an observation by a weather observer, at a place called Pueblo, Colorado in the USA, which is near Colorado Springs. Why bother re-examining these old cases? Well, they generally provide me with data based observations, as opposed to sightings mentioned on Face Book pages, which provide hardly any data points. Secondly, it is always good to revisit/reanalyse cases, to see if a potential mundane explanation has been missed. At 10:46am Mountain Standard Time (1746UTC), on 14 June 1958, a Pueblo, Colorado [latitude 38.28 deg N; longitude 104.6 deg W], airport weather observer, Orville R. Foster, aged 51 years, was observing a pilot balloon through a theodolite. He noticed an object enter the field of view at elevation 24.2 degrees,and azimuth 67 degrees (ENE.) He tracked the object across the northern sky (maximum elevation estimated as 50 degrees) on into the SW sky. Here he lost it in atmospheric haze at elevation 8.1 degrees, azimuth 237.2 degrees. The duration of the event was between 4-6 minutes. The shape of the object at highest elevation was circular, with an apparently flat ring around the object, and a rounded dome in the middle. It appeared white to silvery white in colour. No metallic lustre was noticed. There was no smoke, no noise,no exhaust, and no vapour trail. There were cirrus clouds present at an estimated 30,000 feet and at times it went behind these. The upper air winds during that day were from the SW - which is opposite to the direction that the object was travelling in, therefore it was going against the wind. The observer noted that he had seen high altitude balloons through a theodolite before and this didn't look like them. On the USAF proforma Foster estimates its speed as a minimum 540 mph and, provides an estimate of its diameter as 30 feet. 1. 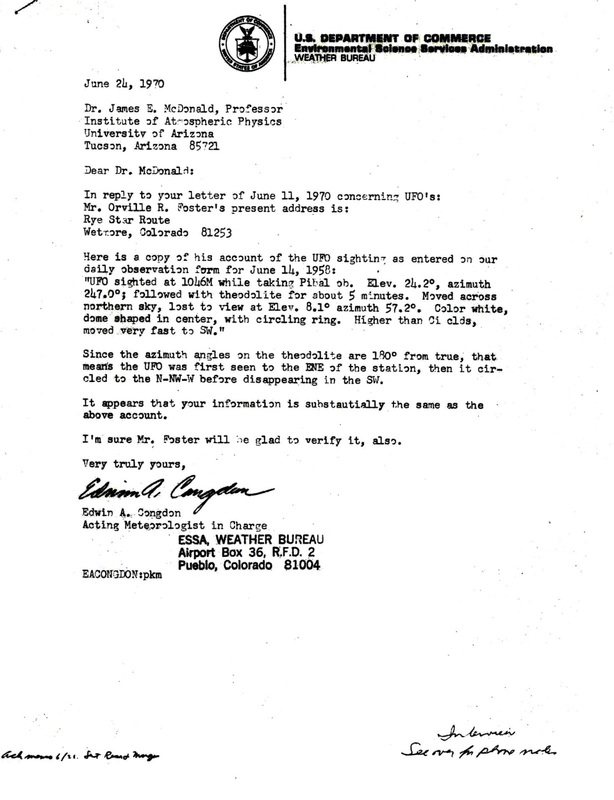 In a letter to the observer dated 14 July 1958 PBB made the statement that many qualified observers had mistaken a high altitude balloon for a UFO. It also stated "Routine checks and research disclosed that an upper-atmosphere balloon, flight No 161, was tracked continuously by the facilities of the AACS and last reported in the vicinity west of Pueblo between the 14th and 15th of June." Here, PBB was suggesting it might have been a high altitude balloon. 2. PBB "Routing slip" on the file stated "This is a toughie. I have approached it from every scientific and logical angle..after performing checks of a/c schedules (both military and civil), radar units, tests and operations, GCC, and others all showed negative..If no resolution, this will be one I must place in the category of 'unknown.'" The "Project 10073 Record Card" conclusion is shown as "unidentified", "unknown." 1. If we assume that the object was at a minimum altitude of 30,000 feet, then we can calculate its range at three points. a. Initial position of ENE sky at 24.2 degrees elevation. Sine 24.2 = 30000/slant range. therefore slant range = 30000/0.4099. therefore slant range is 73, 188 feet. b. Intermediate position in northern sky at 50 degrees elevation. Sine 50 = 30000/slant range. therefore slant range = 30000/0.766. therefore slant range is 39, 164 feet. c. Final position in SW sky at 8.1 degrees elevation. Sine 8.1 = 30000/slant range. therefore slant range = 30000/0.1409. therefore slant range = 212,917 feet. If its actual altitude was above 30,000 feet, then these ranges would be greater than the figures shown. 2. We can calculate an average angular velocity across the sky. 190 degrees of arc traversed. Time taken, between 240 and 360 seconds. Therefore average angular velocity was between 0.53 and 0.79 degrees per second. 3. In order to calculate an actual speed, we would need to know an actual figure for its angular velocity at one of the three known distances. We do not have this data. However, Foster does provide a figure of a minimum speed of 540 miles per hour on the USAF profroma. This suggests that he used some form of average distance and angular speed to calculate this figure. 4. He also estimates the diameter of the object as 30 feet. As there is no data provided for the angular size of the object seen through the theodolite, we can only assume that he calculated this figure based on his 28 years of being a weather observer, and knowledge of the actual versus angular sizes of the balloons he tracked, and a comparison of the apparent angular size of the object in the instrument. a. At the surface - as stated by the observer. Slight breeze - 5 knots from SSW. Wind speed - 5.2 knots. Wind direction From the south. The observer stated "Upper air winds during the day were from the south west quadrant." I checked the University of Wyoming's global upper air readings database for Colorado Springs for that date. Unfortunately their records do not go that far back. 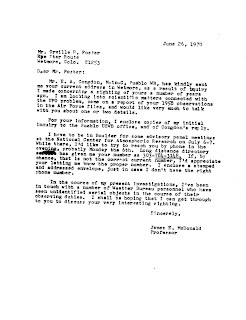 US researcher Barry Greenwood located and forwarded three documents from his archives, which show that McDonald followed up the sighting in June 1970. "UFO sighted at 1046M while taking Pibal ob. Elev. 24.2 deg, azimuth 247.0; followed with theodolite for about 5 mins. Moved across northern sky, lost to view at Elev. 8.1 deg azimuth 57.2 deg. Color white, dome shaped in center, with circling ring. Higher than ci clds, moved very fast to SW."
There is a note that these azimuth readings are 180 degrees from true. Weather theodolites had South as 0 degrees azimuth. 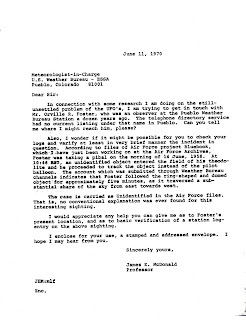 With an address supplied by the Weather Bureau, McDonald wrote to Foster proposing a date for a telephone interview. We have no records of this interview, if it occurred. An unusual object travelled against the upper air winds, at a speed which the observer estimates as at least 540mph, and was described as circular, with an apparently flat ring around the object, and a rounded dome in the middle, with an estimated diameter of 30 feet. It appeared white to silvery white in colour. No metallic lustre was noticed. There was no smoke, no noise,no exhaust, and no vapour trail. The observer was adamant it was not a high altitude balloon. I can see why PBB allocated it to the "unknown" category. I wish to thank Robert Powell, and other members of the NICAP forum for their kind comments on my initial data analysis, which has been amended above based on their comments. 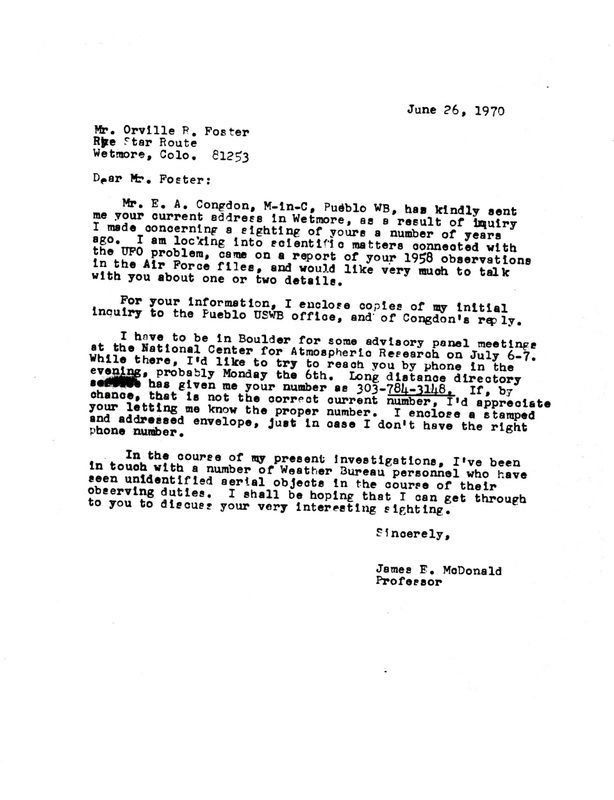 I also wish to thank Barry Greenwood for locating the documents which show James E McDonald's follow up of the sighting. I have read of cases from overseas where individuals have claimed to have used a gun to fire at UAP. However, until today, I had never come across such a reported occurrence here in Australia. I was browsing through a global collection of data, compiled by US researcher Michael Swords and located an Australian sighting, sent to the USA, by the Australian Centre for UFO Studies. What I found was an investigation report by R Delillo and R H Marx (reference number NA78072.) They interviewed one of the two witnesses on 12 June 1978. "We went to Orange to go shooting. It was at a place about 10 miles out of town and fairly hilly and very rocky, with large boulders six feet in diameter and a few trees.It was a grazing property but we were on a slope which was above the area used for grazing. We had been out for quite a while, about 3 hours. We were going up a hill which was fairly steep in a four wheel drive vehicle and were getting no further. My friend and I got out of the vehicle and were standing around it discussing what to do when we noticed a light in the sky. We were about half way up the hill, that is about 200 feet from the bottom of the hill and there was another hill opposite us with a creek in between the two hills. The light was above the hill opposite us.It appeared to be like the headlights of an aircraft but it was moving very, very slowly towards us. I didn't take any notice of it thinking it was an aircraft. After a couple of minutes it seemed to be at a point above the opposite hill about 50 feet above the tree line on top of the hill. It then began to move slowly down the front of the hill. We then turned our car headlights off because we didn't know what might happen. We could tell its position because the light lit up the tree tops in an area directly below it. The light appeared to reflect off the leaves in the tops of the trees but did not illuminate the ground below the trees. At this stage we thought it might be a helicopter but there was absolute silence. After about 3 or 4 minutes it reached a point level with us on the opposite hill and came to a stop. It looked just like the headlight of a car but lacked the distinct beam of a car headlight. It was very bright, with the colour of a quartz halogen headlight.Very white and gave the impression of being slightly larger than a car headlight. We didn't know what to do and were beginning to feel uncomfortable. It was still about 50 feet above the trees and we could estimate the distance since the hill was behind it. My friend said "Oh blow it" and picked up a rifle and fired at it. As soon as he fired the shot the light went out. He used a 243 rifle and was a pretty good shot. The light left a brief after image for about 2-3 seconds. After half a minute we trained spotlights all over the hill but could not see anything. We went immediately home. We discussed the event that night and couldn't sleep well for we had no idea what it could have been and were afraid it might have been a fellow with a torch. We went back the next morning and spent a couple of hours searching the hill for any signs; vehicle tracks; footprints; anything, but found nothing. It had been raining the night before the incident so if anyone had been there they would have left tracks in the very soggy ground. To this day I have no idea what it could have been." Intrigued by the above account I did a search of my Australian newspaper clipping collection, scouring them for any such accounts. To my surprise, I found details of a second shooting incident. "Shots fired as UFO panics town." "A local civil servant fired a volley of shots at a UFO hovering over the West Australian town of Eucla. And UFO fever has gripped this tiny town following sightings over the past three nights of a mystery red and silver object. The 20 townspeople are in a whirl over the sightings but a spokesman for the RAAF said it was unlikely to send an aircraft to intercept the UFO. A local agricultural officer who fired a high powered rifle at the UFO said "It zoomed off in a flash." At lunchtime yesterday several people who sighted the cigar shaped shiny UFO which appeared to be moving towards the town from the South Australian border. After the sighing the object veered away from Eucla but was spotted by several people throughout the afternoon. The shots were fired at the object by Mr A Hardy, a permit control officer with the Department of Agriculture. "I just wanted to see what would happen," Mr Hardy said. Eucla police believe it may be just a bunch of helium filled party balloons which escaped from a dance at a nearby hotel..."
They say our memory fades as we age. A check of this blog reveals that this second story featured in a previous blog from 2013. (1) An examination and analysis of the publicly available 'evidence' put forward so far by the To The Stars Academy, about the Advanced Aerospace Threat Identification Program. (2) Analysis of current Australian UAP sightings, as reported to Australian research groups, and through Face Book pages. It has been a couple of years now since Melbourne based researcher Paul Dean and I took a look at a year's worth of Australian sighting reports. (4) More in-depth "cold case" work on a limited number of classic Australian UAP cases. For a listing of some of my previous work in this area, click here. (5) Further work on the electronic preservation of Australian UAP periodicals. (7) A critical re-examination of the works of a number of well known, high profile, current Australian researchers, with a view to exploring the science behind their beliefs. I will post the results of my research here on this blog. In a previous post dated 20 December 2017, I advised that I was taking a break from UAP research. I have now been absent from UAP research for just over three months, and am returning mentally refreshed. Each break I have taken, has allowed me the ability to pursue other interests during that time. I have renewed my long-term enjoyment of astronomy, meteorology, and SETI, which I will continue alongside my UAP research. Now for a word about my co-blogger, Pauline Wilson. Pauline wishes me to advise readers that she is withdrawing from public UAP research, citing the lack of any real research efforts taking place here in Australia. You will have gathered from her posts since January, that after examining the current state of Australian UAP research, that she has become disillusioned with it. I fully understand her position, as many of her sentiments reflect my own views. I wish to thank her for her time in contributing to our joint blog, firstly in the late 2000's, and just recently. She has always preferred to work "in the shadows" and she is returning to that place. I will shortly be recommencing contributing posts to this blog. You will have noticed that I have been posting more frequently than my usual once a week schedule. The reason for this is that I was hit with an unseasonal dose of the flu, and have been off work for a while. But now I am on the road to recovery. However, this work "downtime" has not been wasted, as I have been able to spend more time researching the work of US researcher Kit Green. I thought that I had brought together all the information available on the Internet, about Kit Green's interest in UFOs. I was wrong. Earlier today I was looking at his entry on LinkedIn and noticed that Green advises that he was the founder and CMO of "Enscion Corporation" between 2000 - present - 18 years. An Internet search for information about Enscion Corporation brought me to a website for the firm. This told me that the firm advises other firms on potential risks for employees, in terms of "developing certain chronic conditions." One of the ways it does this is by the use of "genetic...information." I then typed in "CMO Enscion" into a search engine, which brought up an odd page. The text of this page is shown below. "Still Unknown: unknown object in right hand, see picture/image at bottom, unknown humming and white noise in right ear. All testing was done at the Wright-Patterson AFB Medical Center for (RM Collins) except where noted. Eleven (11) different tests over 16 months. 03-13-012: focused on auditory center, no pathologies. 08-05-011: normal, no pathologies, no trace of any strokes. 03-22-011: normal, Intracranial, no pathologies. Comment: UBOs? Unidentified bright objects noted in MRIs. Thought to be aging vessels, but, much younger people seem to have them in the same areas. 08-16-011: did not show object. 02-18-011: left index finger, did not show very tiny object. 04-11-012: right hand and wrist. Normal except for object shown as just a bump. 02-01-012: sinus area, normal except for inflammation caused by allergies. 01-30-012: normal except for inflammation caused by allergies. I called to just let you know that I planned on talking to Dr. John Balazs today (Dayton). I did. He is a good guy. He is well-versed in attempting to understand difficult - to -diagnose cases, especially hearing cases. He has, as you know, ruled out many possibilities for your noises, including cardiovascular, inner ear causes of tinnitus, issues associated with the hearing tests (he agrees they are normal in your case) and more. He is very willing to order the MRI to examine the matters I spoke about. He should be very willing now to refer you to have the MRI (this was done on, 03-13-012), with no further need for justification...he agrees it should be done. 04-25-012: no evidence of epilepsy. Hypothesis: right hand object is causing the white noise/humming in right ear by going through the Auditory center of the brain then to right ear. *Conclusions: No explanation for right hand object or white noise/humming in right ear. Dr Nagasawa, WP Neurologist asked on 18 April 2012, 'what do you think it is?' From outer space I said. He just nodded. Teleportation, it's the space that moves. Unlike Star Trek, or like it in the 2009 movie, it's the space that carries the object or information instantaneously. Albert Einstein called it, 'Spooky action at a distance.' And, it is spooky for some when 'they' instantly appear in your bedroom. Implant (in right hand, see picture below, taken 04-03-012, originally appeared, 01-24-011) would turn on every 10 seconds (October 9th and 10th, 2011) with a strong humming sensation felt. Right hand puffy area below ball bearing looking object (looks Metallic said the WP Neurologist) is a needle mark. See cropped image below showing more detail. No EMF detected coming from the implant/object using a gauss meter, but a magnet does turn the object on. There is a Dr John Balazs of Dayton, Ohio. He is an ear, noise and throat specialist, which would fit in with some of the symptoms being reported by "Bob" the patient involved. There is a Dr Glen Nagasawa, a neurologist, who practices in Dayton, Ohio. Again this would fit in with some of the symptoms being reported by "Bob" the patient. The Wright-Patterson AFB Medical Center is just east of Dayton, Ohio. R M Collins would appear to be Robert Michael Collins, an associate of former AFOSI special agent Richard C. Doty. It is known that Kit Green and Richard Doty were associates. There is mention of symptoms of an "...unknown object in right hand, see picture/image at bottom, unknown humming and white noise in right ear." This is suggestive of the description of a so called "implant" in an abductee. The phrase "No EMF detected coming from the implant/object using a gauss meter, but a magnet does turn the object on" utilises the term "implant" and mentions no detectable EMF, plus mention of using a magnetic to turn the object on. This terminology is reminiscent of work by by Dr Roger Leir. Leir described implants as emitting radio waves in the FM band; and showing electromagnetic fields in excess of ten milligauss. This page of text was on the website called "ufoconspiracy" and has no dates later than 13 March 2012. The site features a book "UFOs: Exempt from Disclosure by Collins, and Doty. Collins as editor for the site writes: "A question has come up from viewers, 'why do they always show up when you're outside? The best answer I think is what's in my right hand, see attached, and it hums and stings when you rotate any object over the top of it. No Emf measured." Collins prints a photograph of a hand. This is the same photograph which appears in the "odd page" text. This confirms that the individual with the "implant" is none other than Robert Michael Collins, and Kit Green was in on the investigation. In the previous post last week, I updated my knowledge of the UFO work of US researcher Christopher 'Kit' Canfield Green, between 1979 and 2005. One of the more recent research projects I found Green to be engaged in, was a study related to the forensic investigation and diagnosis of individuals injured by anomalous events. This project involved compiling a structured database of individuals that were suffering enigmatic injuries, burns, skin lesions, cancer and diseases. The most significant factor being that all these people had also had 'face to face' encounters with UFO/UAPs. The analyses of which took some two years. It revealed some very interesting data. Although due to patient confidentiality a lot of it remains outside the public domain. Many of Green's one hundred plus patients were military personnel or from aerospace industries. Their own search for treatment had been exhausted with little or no positive results from regular doctors. Dr Green worked on diagnosis from virtually nothing. He based his hypothesis on patients being exposed to some form of black ops technology such as Non-Lethal Weaponry, Holograms, Cloaking technology and drones. Brain scans, blood, DNA and endocrine tests were made. Green later teamed up with Dr Garry Nolan a specialist in genetics, immunology and bioinformatics. Nolan agreed with Green. He thought patients had been exposed to an electromagnetic field leading to inflammation and other bio markers. These showed up in MRI, tissue and blood scans. Something medical technology had not previously been able to pinpoint. So called 'Experiencers of anomalous phenomena' often show certain biomarkers and DNA changes. Dr Green has, in recent years, worked with Rendlesham Forest UFO witness John Burroughs. The results of which were successful treatment for heart damage and, after years of dispute, the Veterans' Association (VA) finally agreed to pay the treatment. Interestingly John Burroughs claims he has a document proving that a weapon was developed off the back of what he encountered in Redlesham Forest. Although to date he has not released that publicly. While the reasons for treating these people are perfectly altruistic the data gleaned could also be vitally important to certain interested parties. I located an earlier post from this blog about Burroughs' records, referenced from a 2014 book co-authored by Burroughs. I then looked for further information about Green and Burroughs and found another Above Top Secret website thread, where Green had posted about this, dated 13 March 2015. "This is a reply to the entire thread...and will only address two issues that are common throughout many comments on this thread. They are: Q#1...How can it be true that medical records such as John Burroughs could have been classified...Is this true? Is it sensible? What are the reasons? And, Q#2...what caused his injuries (and several others present over the encounter) with the odd Air Form that emitted the Broad Band NIEMR? It is true, his records...about a thousand pages, and to this day, still many hundreds are in fact legally classified. In my 46 year career as a Medical Officer and physician with the CIA [including as Staff officer Chief of Medical intelligence/Life Sciences Division, and Assistant National Intelligence Officer for Science and Technology] had, until a year or so ago...only seen a handful of truly 'classified' medical records; those of Adolf Hitler, John Kennedy's autopsy and recently ...John Burroughs. The reasons (I was told by current DOD and VA records staff that:inside the doctors' notes, the nursing notes, the specialists' notes are a myriad of references to Special Access Projects and the names of OTHER adjacent and ancillary programs and projects that cannot be disentangled, and which could uncover active and recent projects unrelated to Rendlesham. The reasons are not necessarily related to Rendlesham...and not all the connections relate to Rendlesham. This makes some sense operationally, but no sense ethically...John was hurt, he needed care, then, often, and now. He had injuries we now understand are related to narrow RF bandwidth that only in some cases in the past five years have become linked to the specific etiology of cardiac and other injury he suffered. There are likely other persons and other injuries. So, Q#1...Yes, his records were classified. Some remain classified. The reasons are not entirely ethical. Thank god that a couple of senators had the guts to push, and push to 'disentangle' that which was legitimately classified from those records that were needed to make the right decision about injury sustained while on Active Duty... Period. It is/was true. It is sensible. It is not entirely the stuff to make us physicians very proud. Very few physicians even care about this arcane area of research...and fewer know about the injuries sustained from near-field (<100m) to humans. The data is sparse, it is not properly peer-reviewed, it is not understood, it is not the subject of current research. And that is the truth. The decision that was made to grant medical disability to John was just. Some of the records will remain classified. Those of us in Military and Intelligence Medicine can be proud the right decision was finally, if belatedly made; we should remain both vigilant and ashamed that our profession remains improperly darkened, and we should bring it to the light where we can." What is broad-band non ionizing electromagnetic radiation. "Ionizing radiation is radiation composed of particles that individually carry enough kinetic energy to liberate an electron from an atom or molecule, ionizing it. These include cosmic rays, gamma rays, x-rays and can be produced from radioisotopes, x-ray tubes and particle accelerators. Exposure to ionizing radiation causes damage to living tissue, and can result in mutation, radiation sickness, cancer or death. Non-ionizing radiation refers to any type of electromagnetic radiation that does not carry enough energy per quantum to ionize atoms or molecules. These include thermal radiation, radio waves, microwaves, infra-red, visible light and ultra violet light. Health risks: Non ionizing radiation can produce non-mutagenic effects such as inciting thermal energy in biological tissue that can lead to burns... While the long term effects of high levels of non-ionising electromagnetic exposure are not well known, the diagram above shows that unless you were to stand directly in front of the roof mounted antenna, there would be little to no detectable radiation exposure." "Researchers also studied people who said they had experienced physical effects from encounters with the objects and examined them for any physiological changes." We have been told researchers studied people who were UAP 'experiencers' for physiological changes. "...Researchers also studied people who said they had experienced physical effects from encounters with the objects and examined them for any physiological changes..."
I think we can guess who was involved in the studies of these experiencers." Is the January 2018 ATS thread referring to Green when it says "I think we can guess who was involved in the studies of these experiencers?" For further reading take a look here which states that "Burroughs was granted full medical disability. However, they say his medical records still remain classified.' Burroughs heart issue is stated to have been 'a badly shredded anterior mitral valve." In his own statement Burroughs asserts that he received "a settlement from the DOD and VA admitting I was injured in the line of duty in December of 1980." However, he does not provide any actual copies of the VA's determination letters where we can plainly see for ourselves the connection between the events of the 1980 UK encounter at Rendlesham, and Burrough's heart problem. Burroughs did locate the following statement in Annex F, page 4, volume 2 of "Unidentified Aerial Phenomena in the UK Air Defence Region" published December 2000 by the UK MOD. "The well-reported Rendlesham Forest/Bentwaters event is an example where it might be postulated that several observers were probably exposed to UAP radiaition for longer than normal UAP sighting periods." This project of Green's is awfully reminiscent of much earlier work undertaken by US researcher Richard Niemtzow. Between 1981 and 1991 Niemtzow ran 'Project UFOMD.' This was a network of doctors intensively studying UFO related injury cases. Niemtzow published a widely reported appeal for such cases, in the UFO literature of the time, and spoke of looking at radiation caused UFO injuries. Niemtzow studied the Cash-Landrum incident; six other cases from Texas; and the Dr 'X' case in France. The specific area of interest to both Niemtzow and shadowy French researchers was in the use of microwave radiation. For a comprehensive article about the work undertaken by Niemtzow, published in October 2016 on this blog, click here. I am off to find a copy of "Phenomena" by Annie Jacobsen. I suspect that the paraphrasing of her work in the Above Top Secret thread, might not tell the whole story from her book.